One part of my apartment that isn’t overly cluttered with beauty products is the shampoo and conditioner area of my shower. No, the stacks of hair masks don’t count. With a pixie cut, I don’t require much natural shampoo or natural conditioner, so it takes me quite a while to get through a bottle of product. 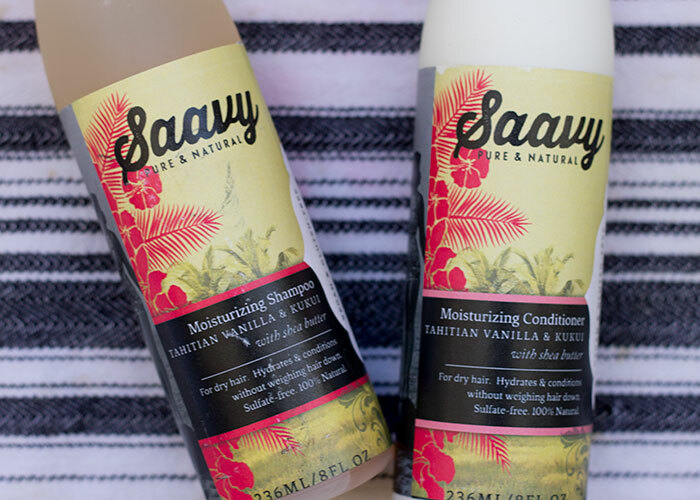 After finishing up my previous bottles, I was excited to move on to the prettily packaged Saavy Naturals Moisturizing Shampoo and Moisturizing Conditioner. As you can see on the labels, Saavy Naturals Moisturizing Shampoo and Moisturizing Conditioner is formulated for (shocker) dry hair. If you’ve been on the blog for a while, you know I’m the oiliest person in the world. However, I feel that it’s important to drench your locks with a great hydrating wash and rinse if you heat dry a lot (every day for me), and because my scalp can get a bit dry, I like the extra attention a formulated-for-dry-hair duo can bring to my own mane. Saavy Naturals Moisturizing Shampoo and Moisturizing Conditioner definitely delivers hydration and a gentle cleanse to my heat-shocked hair — and does so without the help of synthetics or sulfates. In fact, the ingredients list for both the shampoo and conditioner is so nourishing that you’d want to eat it — which makes sense, as the founders of Saavy Naturals come from epic foodie backgrounds. As you can see, Saavy Naturals Moisturizing Shampoo and Moisturizing Conditioner take advantage of luscious oils such as kukui seed, argan, moringa and coconut to drench your hair in a sea of moisture. Neither the shampoo nor the conditioner, though, weigh your hair down, and the shampoo offers a nice, gentle lather and subtle scent of vanilla. The creamy conditioner has a stronger vanilla scent that lingers a bit after rinsing, giving your head that come-hither scent (even if the only thing coming hither is your Siamese cat, whatever). All joking aside, one thing I do want to point out in Saavy Naturals’ shampoo and conditioner is the fact that they do both use honeysuckle extract, a somewhat controversial ingredient in the green beauty community. There’s several schools of thought out there, and I don’t have a fully formed opinion on it, but those who prefer to leave honeysuckle extract out of their clean beauty routines do so because honeysuckle extract acts as a paraben, though it is obviously a natural ingredient. It contains para-hydroxy benzoic acid, which is readily found in nature yet is said to look structurally similar to synthetic parabens and is said to act in the same way — as an endocrine disruptor. Those who don’t mind seeing honeysuckle extract on their ingredients lists note that it scores a “0” on the EWG Skin Deep Database and it may not produce the same health risks as synthetic preservatives. So, you can see why there’s some back and forth on this ingredient. I’d like to learn more about it — and see what you think, too. And for that reason, Saavy Naturals Moisturizing Shampoo and Moisturizing Conditioner are on my “maybe I will repurchase it” list. When it comes to product performance, I loved the formulas — the scent, the moisture, the gentle cleansing and deep hydration. When it comes to packaging, I appreciate the pretty designs and bold colors — though I was disappointed that the paper labels disintegrated in the shower. When it comes to ingredients, we’ve got to figure out this honeysuckle thing. Have you tried anything from Saavy Naturals? What are your thoughts on honeysuckle extract? Please do tell me in the comments section!